This issue and the next (due out in March 2017) highlight new and original work on the theme of Mad Studies – inspired by the second Mad Studies stream at the Lancaster Disability Studies conference in September 2016. Mad Studies can be seen as both a continuation and a new phase of radical scholarship and activism in mental health. By the final session of the conference, there was a real sense that Mad Studies had come of age. Conferences aren’t all about the presentations. They’re also about the buzz: conversations had, and connections made. Here, and in the next issue, we include some of the presentations, but also reflections on the event, along with contributions from our Canadian, Scottish and Northumbrian colleagues who are doing Mad Studies in their respective communities. 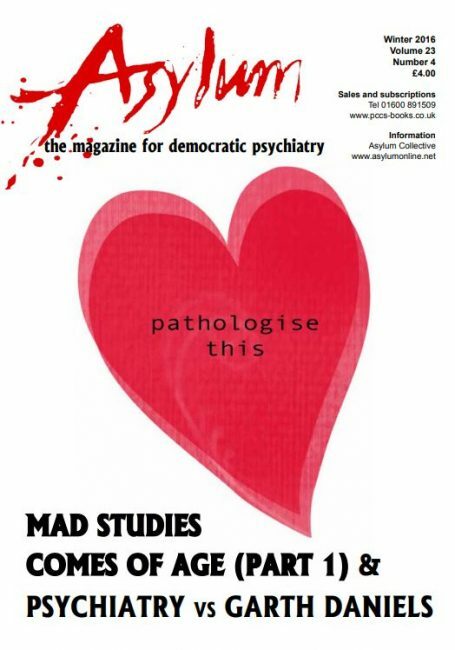 Dolly’s Sen’s artwork, which features on our front cover, was the emblem of the Mad Studies stream. It is inspired by her belief that madness comes from a broken heart, not a broken mind. This packed issue also includes an extended piece telling of Garth Daniel’s continuing struggle with the psychiatric system in Australia. If Mad Studies is to mean anything at all, it has to be relevant to the ongoing concerns of people like Garth. You’ll find here a response to Diana Rose’s interesting provocation in Asylum 23.3. We end, as usual, with a selection of mental health news & findings. We hope this issue whets your appetite for Mad Studies, and engages you in the debates that are opening up about it. Part 2 to follow… Don’t forget to renew your subscription!